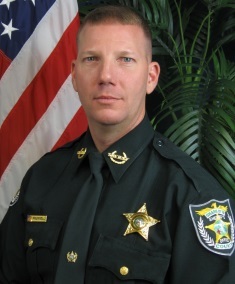 The Florida Sheriffs Risk Management Fund is pleased to highlight our newest member of the Board of Managers, Sheriff Bill Prummell of Charlotte County. A 26-year law-enforcement veteran, Sheriff Prummell has been with the Charlotte County Sheriff’s Office since 1992, rising through the ranks before being elected Sheriff in 2012. My family encouraged me to get involved in the law enforcement field. Before I began my career as a first responder, I was a carpenter and cabinet maker by trade. I had several relatives who thought I would be good in law enforcement, so when I was thinking about switching careers I decided to listen to them. When I moved to Florida, I applied for a position with the Sheriff’s Office, and the rest is history. I feel like I’m making a difference in the community. I’ve been able to do things as Sheriff that benefit our citizens. I have also been able to positively impact our office, putting regulations in place and providing the necessary equipment and training to keep deputies safe. This way they can perform their jobs effectively and efficiently while serving our county. What is the most challenging part of being Sheriff? Probably the politics – which I do not like. But I’ve learned that it’s a necessary evil. The Charlotte County Sheriff’s Office has been involved in many different programs with the Fund. When I was given the chance to serve, I jumped at the opportunity. I was also excited to get involved because insurance was an area that I was not as comfortable with, so I wanted to learn more about it. As Sheriff, I deal with risk management on almost a daily basis, so I wanted to educate myself and become more involved. The Fund is very important to our field. As we come together collaboratively as Sheriffs, we can learn from each other because we know what our agencies face day-in and day-out. This helps us better understand which services our individual offices need. It helps us to keep our costs as low as possible, as well. As stewards of our budget, keeping costs down is a vital part in making sure our offices run smoothly. When I’m not working I enjoy spending time with family. My wife, Tara, and I have two sons and a daughter – Billy, Catelynn and Andrew. Our son Billy and his wife, Marla, also had our first grandson, Billy IV. I also like to be out on the water, whether we’re skiing, tubing, fishing or just hanging out and relaxing as a family.